It began with the long chain of distraction that we like to call Wikipedia. Not sure what I started looking for, but eventually I was led to Canadian food. This was a pretty interesting topic, because there were things on the list that I grew up eating, and had no idea they were distinctly “Canadian”. I wanted to drill down to local cuisine, specifically Toronto, so I clicked the link that led me to it. Back to my original question, “How hard is it to identify a city’s cuisine?”. Pretty hard, in a city that’s as ethnically diverse as Toronto is. We’re often accused of not having any of our own cuisine, because of the proliferation of other kinds of cuisine. It’s partly true, but at some point the mesh of all of those cultures becomes a part of us… how long before everyone just accepts it? There is, however, one solitary item on the Wikipedia page that stood out as possibly being “traditionally Toronto”. I had never had one before, and decided to resolve that right away. Luckily, there are three places known for their peameal bacon sandwiches, and all happen to be in the St. Lawrence Market. We chose to stop at Carousel Bakery, mostly because the buns looked incredibly fresh and soft. Yum! It was a little bit plain – salty, mild meat wrapped in soft tasty bread. It could have used some sharp mustard, and no doubt I would have put some tomatoes and lettuce on it if I had had the option. Still, eating this sandwich gave me a sense of the spirit of the market, and of Toronto. 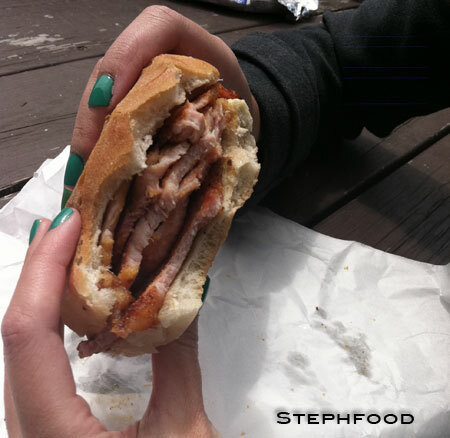 People do usually put mustard on their peameal bacon sandwich. They have it on the side of that food stand. I find it too salty, so I don’t have it that often. 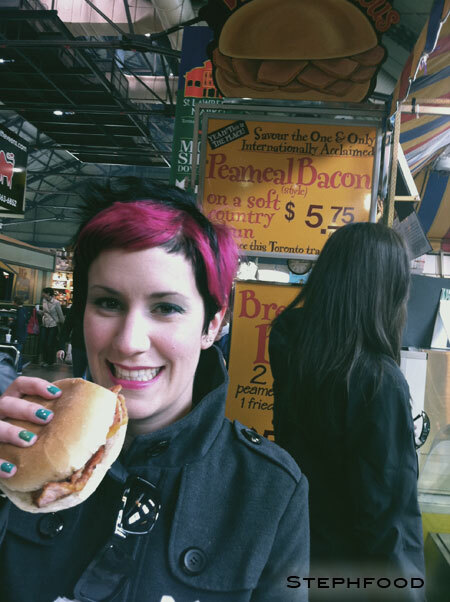 Oh man, my husband and I went to Toronto and had the peameal bacon sandwich at St. Lawrence market and it changed ours lives. AMAZING!